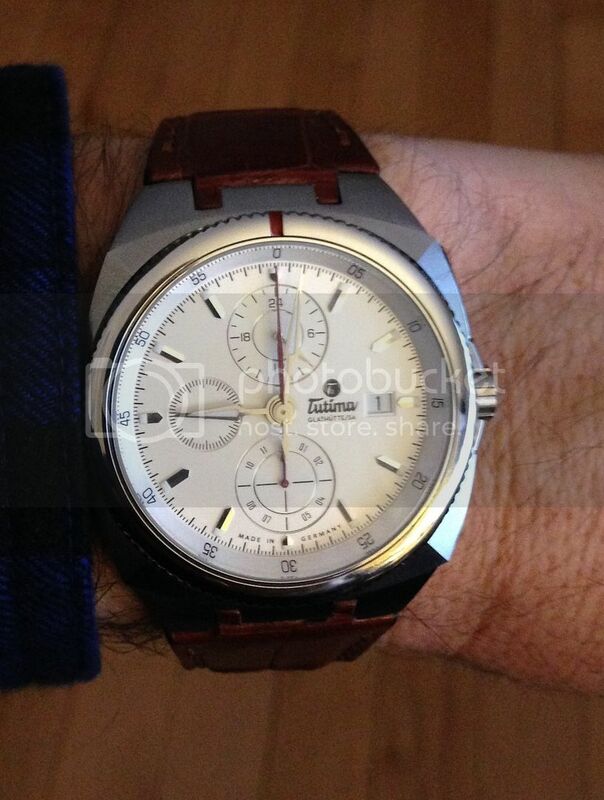 I recently got the chance to wear the Tutima Saxon One Chronograph for an extended period of time. Frankly, it's a beautiful watch! Fit, finish, and detailing are excellent. The opalescent white dial with stainless steel hour points, uniquely styled hands, and accent rings to the larger sub-dials present a striking image. And although some might consider the watch to be a wee-bit large for a dress chronograph (43mm x 15.7mm), it fills that bill admirably. 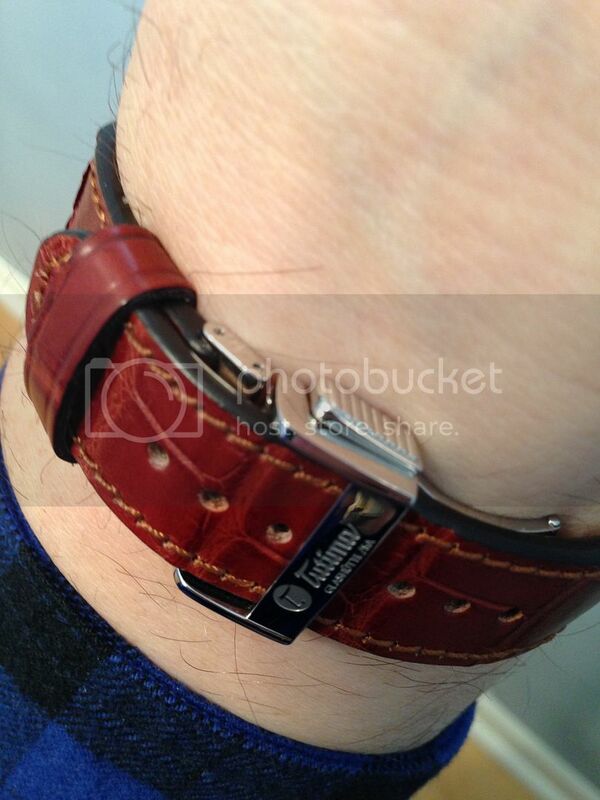 The deployant clasp that cinches the alligator strap to your wrist is slightly different in design and appearance from a typical deployant, but not in function. This makes for a pleasantly different overall appearance, and adds to the watch's uniqueness. The Saxon One and its rough & tumble brother, the M2, are the heirs apparent to the venerable NATO series of chronographs that Tutima supplied all NATO pilots (and others) for a couple of decades in the later part of the last century. Present are the signature flat, integrated chrono pushers and small diameter, partially recessed crown (which takes away the need for crown guards). The knurled bezel rotates bi-directionally and is marked with another Tutima signature, a bright red tick mark. This makes the bezel handy for marking starting or desired end time. In addition, hands associated with chronograph features are red. These features are capped off with perhaps the most significant Tutima chronograph feature of all, a center chrono minutes totalizer. This, of course, was standard on the old Lemania 5100 which powered the NATO chronographs. Since that movement is no longer available (Tutima exhausted the remaining supply several years ago), Tutima's new Glashütte factory and design center undertook a proprietary redesign of the Valjoux 7750 to incorporate center chrono minutes along with the addition of a 24 hour totalizer sub-dial at 12 o'clock. All of this makes the movement's appearance, function, and performance indistinguishable from the Lemania calibre (I know, because I have both on my desk as I write this). 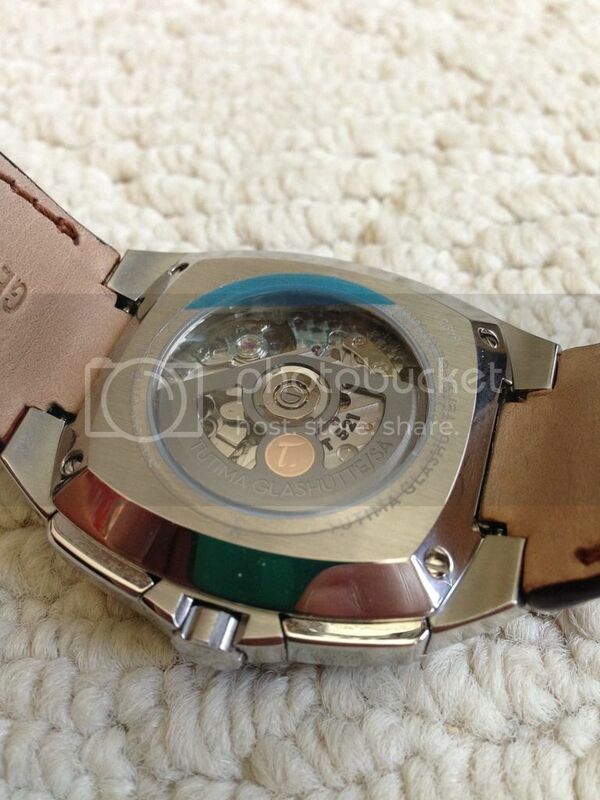 And since the base calibre is the 7750, we can expect a watch so-powered to have an exceptionally long life. 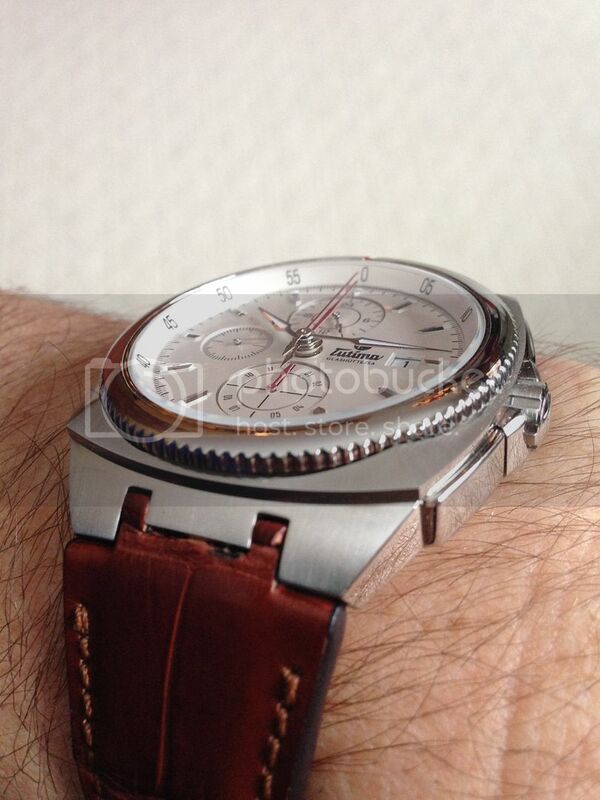 The stainless steel, cushion-shaped case is 43mm across and 15.7mm thick. The case features a domed sapphire crystal with anti-reflective coating on both sides. The case back is a display back with a flat sapphire crystal. The flat pushers make the Saxon One remarkably symmetric for a chronograph. Perhaps their best feature, beyond extreme good looks, is the fact they won't get caught up on shirt sleeves. As mentioned before, the bezel is a non-click, bi-directional coin-edge bezel with a red tick mark. 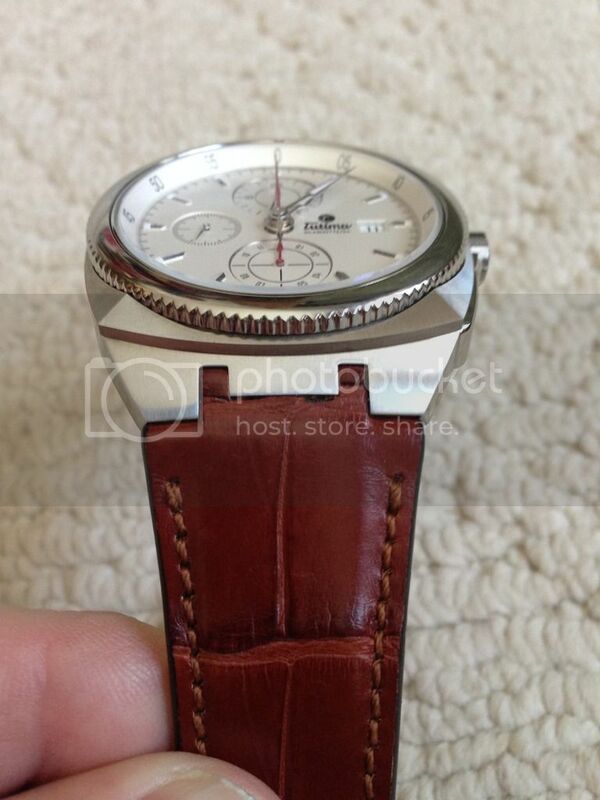 The crown is screwed down, giving the watch a rater resistance rating of 20atm. The movement is the aforementioned modified Valjoux 7750 / Tutima calibre 521 automatic with sub-dials for running seconds. 24 hours, and chrono hours. The automatic winding rotor is skeletonized and decorated with a solid gold medallion featuring Tutima's logo 'T.' The the cal. 521 has a power reserve of 38 hours. The dial is a striking opalescent white with stainless steel accents and hands. The sub-dials are recessed, with the larger ones (for 24 hour display and chrono hours) are trimmed in stainless steel. The date is displayed at 3 o'clock. The print of the date, brand signature, and MADE IN GERMANY is a sharp black and the hands for the chrono functions are red. These colors offer just the right contrast to balance the overall brightness of the dial.